We are excited to announce that Premier Press is exhibiting our Influencer Marketing and product launch seeding kit capabilities at LUXEPACK’s Los Angeles trade show. LUXEPACK is the premier business to business tradeshow dedicated to luxury packaging and is returning to LA for it’s 2nd edition February 27-28. Premier will be among 75 packaging providers with expertise in glass, sustainable packaging, influencer packaging, displays, promotional items etc. We are eager to showcase our innovative packaging solutions. Premier will be showing a variety of influencer marketing and product launch seeding kits for premium brands like SmashBox, Red Bull, Nike, adidas, and Clif Bar. 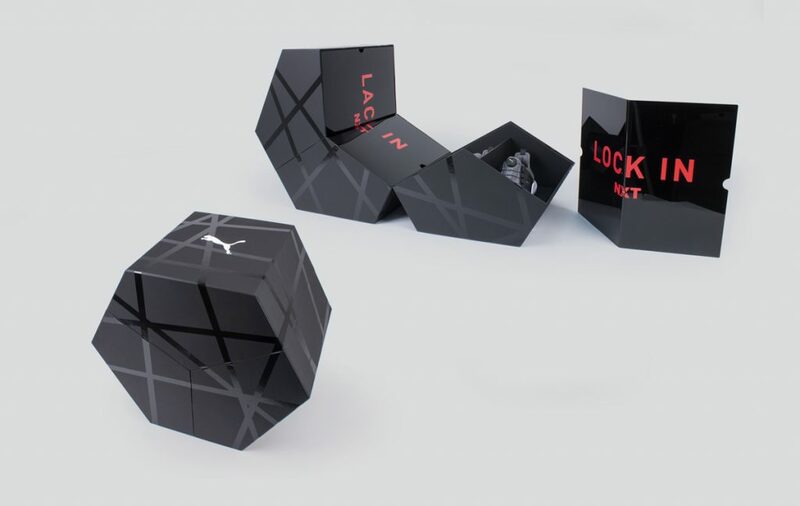 Creative packaging that is as innovative and exciting as the product itself. See more images of this project. During 45 years in business Premier Press has evolved into a powerhouse creative production company. We work with clients to create custom packaging, branded environments, and retail graphics to make their brands stand out. If you’re in the area come see us at Booth E01! Learn more about LUXEPACK Los Angeles or register for the show. Take a look at at more of our Custom Packaging Projects. Digimarc works with retailers and consumer packaged goods companies—including New Seasons Market—to transform product packaging and print pieces into connected media that can be scanned by phones and retail barcode scanners. Yet Digimarc wanted to share a new vision and inspire the design community with future possibilities. The design concept is Signal Rich™ art and they turned to Premier Press to help make a splash at the biggest design gathering on the planet, Adobe MAX in Los Angeles, and hold the first-ever exhibition of Signal Rich art. With Signal Rich art (not yet commercially available), the code is inherent in the design. The artwork contains a number of codes repeated throughout the artwork. In essence, the code is the art. Digimarc needed the art to cover eight large booth panels. Premier used its HP Latex 3000 large-format printer to print eight separate versions of the artwork. 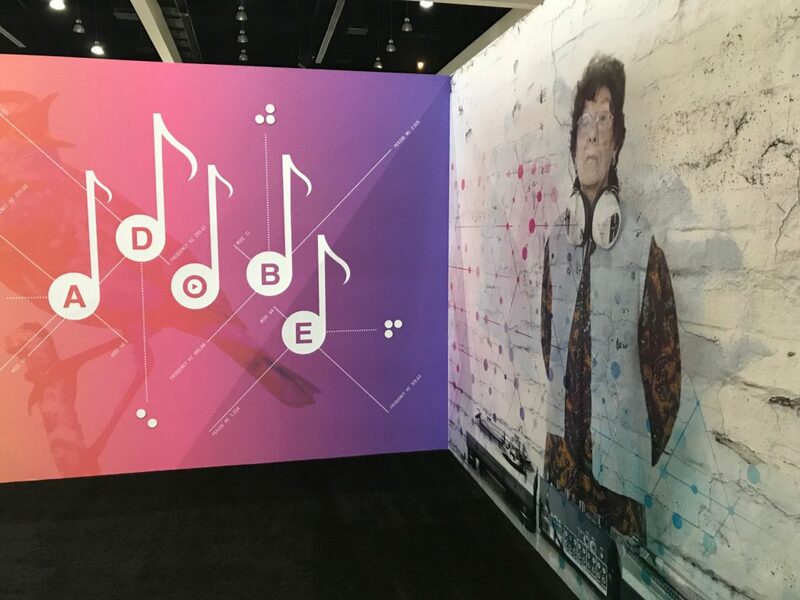 The 10 ft. x 8 ft. artwork was printed and shipped to Los Angeles where professional installers applied it to the panels at Adobe MAX. Digimarc’s event marketing team was busy preparing for the show, and appreciated how Premier Press was able to complete the project in just a week and a half from start-to-finish (including proofing time). Along with pioneering Signal Rich art, Digimarc offers Digimarc Barcode, an imperceptible barcode for commercial print and product packaging. Consumers can scan a poster or a box of cereal to get coupons, prizes or additional product information. Unlike a QR code or UPC barcode, Digimarc Barcode is a part of the art file. Companies like Campbell’s, Barilla and Golf Magazine use Digimarc technology to link consumers from print to digital experiences. We see Digimarc Barcode offering cutting-edge technology at a great value. For example, we can add the code to virtually any marketing asset, and integrate with our online portal to easily initiate a reorder by scanning the asset using a phone or other mobile device. Retail customers could reorder in-store graphics; field sales reps could reorder sales collateral. Talk to your Premier sales rep for more ideas. To find out more about Digimarc’s technology, and get your first Digimarc Barcode for free, contact Digimarc’s Paul Vorvick at Paul.Vorvick@digimarc.com. Expanded capacity and capabilities allow customers to rely on us for more services, without needing to manage as many outside vendors. We’ll be able to produce more work, faster, and handle more kinds of projects in-house. We’re excited to announce that Premier Press and JTW Partners, previously known as Ivey Performance Marketing, are combining forces in an acquisition that capitalizes on the strengths of both companies. During our 44-plus years in business, our industry has seen transformative changes — and so has Premier Press — as we’ve evolved from a traditional commercial printer into a powerhouse creative production company. We’ve always fostered a culture of continuous improvement, allowing us to adapt and thrive in the face of change and looking for ways to improve the services we provide. Folding in JTW’s expert team and capabilities into our services is the latest step to providing the best creative production anywhere. Like Premier, JTW’s roots go back more than four decades and has a solid reputation for providing exceptional, customer-focused marketing services. There are many synergies in our customer base and services, so together, we see a great opportunity to grow while providing clients of both companies with a broader range of services. All under one roof. Our new expertise, expanded capacity, and increased capabilities mean allows Premier Press customers to rely on us for more services, without having to manage as many outside vendors. We’ll be able to produce more work, faster, and handle more kinds of projects in-house. We will also be bringing many of JTW’s employees on board, including client services representatives and other key resources. The acquisition went into effect as of November 1. We expect to have all employees and operations under one roof at our Portland facility before the end of 2018. Looking for an innovative approach to your creative production challenges? Get in touch! The way any idea is presented can make all the difference between success and failure. We are excited to have helped Nike’s Converse brand create this very unique package that generated tons of excitement when sent out to influencers. View the video to see what happens when you wrap four shoe coupons into a memorable package. Putting four coupons in an envelope may have helped nurture customer loyalty but it would not have generated the excitement that leads to this type of evangelism. If you have a product launch or other initiative coming up, contact us to talk to our creative team to see what we can do to make your product stand out. Joseph Gallivan from the Portland Tribune recently paid us a visit in our Pearl District headquarters. While he came to talk about our upcoming move to Swan Island, what he ended up enthralled with was the the wide range of services we do for our clients. He touched on everything from wide format retail graphics, custom boxes for high end promotions, custom books, to our impressive equipment like large format printers, Zund router, and six color offset presses. Wieden and Kennedy opened up their doors to the Pearl for August’s First Thursday to display Portland Design Museum’s exhibit of Green Patriot Posters. Graphic and striking visual reminders of the precarious position global warming presents, the Green Patriot Posters were commissioned to bring environmental awareness, educate and invoke response from the public. The creative work from 50 designers is displayed in the W&K gallery. Each poster is a thought provoking and creatively designed message shedding light on a dirty situation. The Green Patriot Posters were printed sustainably at Premier Press using VOC-free UV ink, 100% wind powered and carbon free footprint. The art is directly printed onto Eco board, a substrate which is 98-100% post-consumer recycled material. No plastic laminate was used. It is 100% recyclable. Equipment and process along with materials is critical in the #sustainableprint equation. Premier Press is certified green by SGP, Sustainable Green Printing Partnership. This certification requires ongoing third party audits and continuous improvement in sustainability through manufacturing best practices, social responsibility and public education to reduce environmental impact. The evening was entertaining as well as enlightening. Drinks were served alongside amazing appetizers provided by Devils Food Catering. It was an evening of meeting and talking to people who care about the environment, enjoy great graphic design and were affected by the ecological messages communicated through art, and were in good Portland form, fun to hang with. 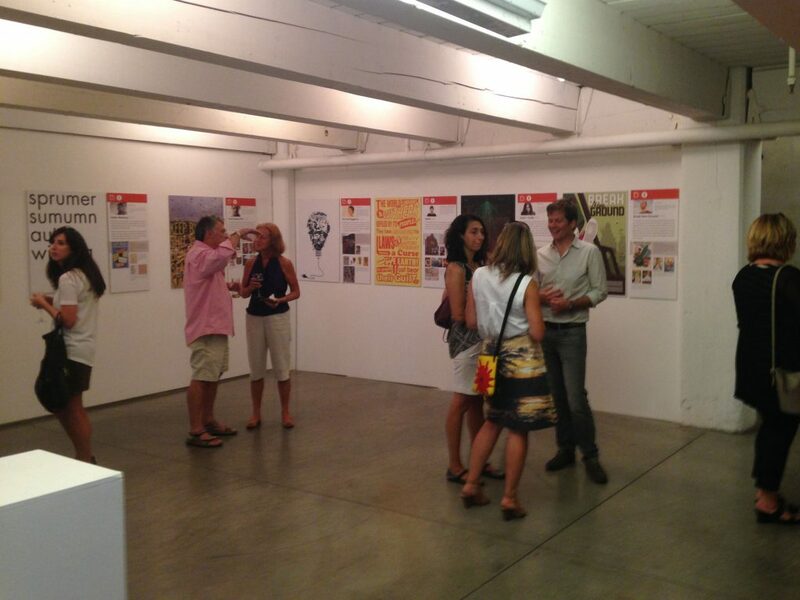 The exhibit is running now until September 26th. Stop by. Check it out. Share what you see. Make the difference. The Green Patriot Poster exhibition opens August 8, 2014 at Wieden & Kennedy. The exhibition displays beautifully designed posters created to raise awareness and support the battle against global climate change. 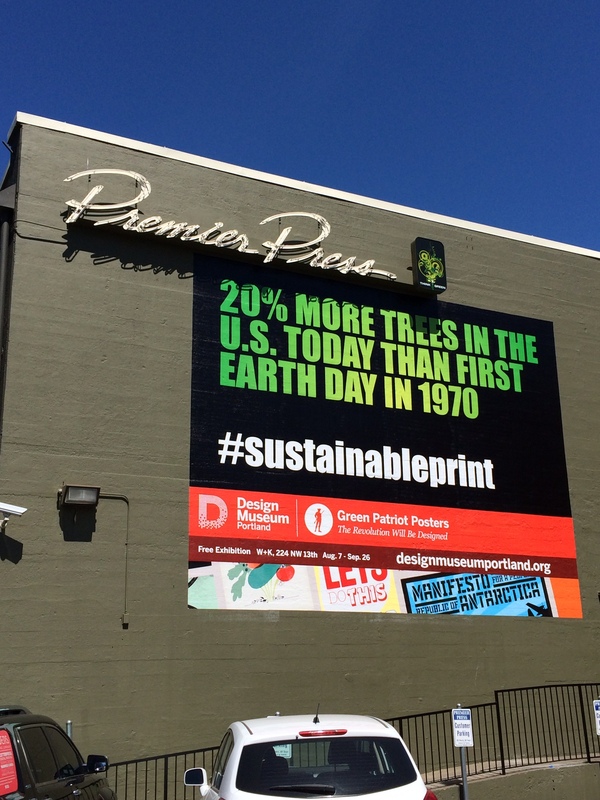 In support of this green initiative, Premier Press reproduced the artwork using sustainable UV voc free print direct-to- board, a recycled/recyclable material. In the same spirit, the Green Patriot Poster project communicates the call to make behavioral changes to help save our environment through graphics. The Design Museum Portland stages public exhibitions, events and programs to show the “who, why and how” behind great design and innovative thinking that is part of our everyday lives. Spotlight on how great design incorporated into our environment enhances our everyday lives socially, economically and environmentally. Come by Wieden & Kennedy, 224 NW 13th Avenue, Portland, Oregon to see this incredible displayand be inspired!